Follow the A600 towards Shefford. Follow the A507 towards Shefford (Ampthill Road). * At roundabout, take 2nd exit A507. * At roundabout, take 3rd exit A600 (Hitchin Road). * Pass through 2 roundabouts, remain on A600. * (on the right shortly after the Holwell junction). Follow the A1 / London Road towards London and the South. At Junction 10 take the slip road to Baldock Services, then 3rd exit at roundabout on to A507. Pass through 3 roundabouts, then at the 4th roundabout, 1st exit B659 (Hitchin Road). 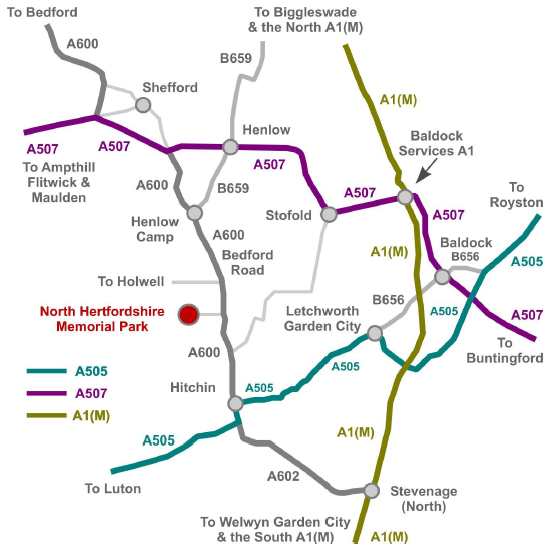 At roundabout, 1st exit B600 (Bedford Road), pass through next roundabout remain on A600. Arrive at North Hertfordshire Memorial Park (on the right shortly after the Holwell junction). Follow the A505 (Baldock Road), take first exit at roundabout. Pass through roundabout over A1(M) stay on A505 (Letchworth Gate). Straight on at the Longabout, A505, at roundabout, 1st exit (Baldock Road). Remain on A505 (Road changes to Hitchin Road). Remain on A505 (Road changes to Cambridge Road). Pass through roundabout, traffic lights and roundabout, A505. At next two roundabouts, 2nd exits A505 (Nightingale Road). At roundabout, 2nd exit A505 (Fishponds Road). At roundabout, 2nd exit A600 (Bedford Road). Pass through 3 roundabouts, remaining on A600. Arrive at North Hertfordshire Memorial Park (on the left). Follow the A507 towards Baldock (Baldock Road). Road changes to Clothall Road. At roundabout, 2nd exit (Clothall Road). Straight on at traffic lights (Great North Road). At Baldock Services, 1st exit on roundabout A507. Pass through 3 roundabouts, remaining on A507. At roundabout, 1st exit B659 (Hitchin Road). At roundabout, 1st exit B600 (Bedford Road). Pass through roundabout remain on A600. (on the right shortly after the Holwell junction). At junction 8, slip road to Stevenage North & A602. At roundabout, 1st exit on to A602. At roundabout, 3rd exit (Parkway). At roundabout, 2nd exit on to A505 (Old Park Road). Keep left to stay on A505 (Bedford Road). At roundabout, 1st exit on to A600 (Bedford Road). Follow the A505 towards Hitchin (leads in to Moormead Hill). Remain on the A505, (road changes to Offley Road). Straight on at roundabout, A505 (Upper Tilehouse Street). At next roundabout, 1st exit on to A505 (Old Park Road). Pass through 3 roundabouts, remain on A600 (Bedford Road).